The IT9100 power meter can provide the maximum input of 1000 Vrms and 50 Arms and measurement bandwidth of 100 KHz, and can be easily used for measuring the voltage, current, power, frequency, harmonics and other parameters. The standard configuration includes USB, GPIB, RS232 and LAN communication interfaces and also interfaces for USB-based peripheral devices. Users can save the measured parameters into the external storage medium. The basic voltage and current accuracy is 0.1%. Moreover, the power meter has rich integrating functions, such as the active power. It is widely applied in test of motors, household appliances, UPS, etc. IT9100 series power meter provide a 4.3-inch color high-resolution TFT LCD for the user, and real-time values can be displayed with high brightness and remarkable colors even in a dark test environment. In addition, the IT9121 power meter provides multiple interface display styles (View1,View4 and View12). The user can customize the screen display parameter type and display sequence. The humane design meets engineers’ measurement demands in different tests. 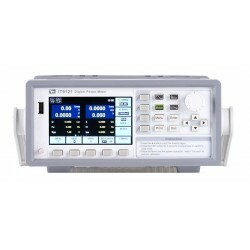 IT9100 series power meter can display the waveform basing on sampling data. You can choose to display or hide the waveform of the input voltage and current. Oscilloscope function of IT9100 series power meter allow users to directly observe the display fluctuations of voltage, current and power trends when testing household appliances performance, and can set the display trends, waveforms, values, histograms. Users can directly capture the waveform and record the value without external oscilloscope via external USB storage interface. The IT9121 power meter has a bandwidth of 100KHz, which can realize high-speed harmonic measurement within a wider dynamic range. In the harmonic mode, the voltage, the current, the active power, reactive power and phase of each harmonic and the factor of total harmonic distortion (THD) can be tested.